What you'll read below is a slightly expanded and edited version of a post I put on facebook after this morning's "Day of Reckoning" hills workout. Big ups to everybody who showed up today in the cold and powered through the rain for the full 30 minutes. I was inspired by all of the high fives, words of encouragement, and smiles despite the pain (and the rain!). I’ve been on the sidelines when it comes to running since my knee surgery last November. Rehab has gone well overall and I was discharged from physical therapy yesterday. But I’ve had a few false starts with running in the last couple months. Those were frustrating. Anybody who has rehabbed from an injury knows how demoralizing it can be to take steps backward. I knew before this morning’s workout that I wouldn’t be as fast as I used to be. Speed will come in time. I wasn’t even sure I’d be able to run the whole 30 minutes. Endurance takes consistent training. I honestly questioned whether I’d make it more than a couple laps. I was prepared for the worst but I made a verbal promise to the group that I wasn’t going to stop. I challenged them to do the same. What I didn’t expect was for my first Day of Reckoning since surgery to be so amazing. This was my first run in a long time where I felt like I got to push my limits. My only pains were muscle fatigue and gasping desperately for air. I consider that a success! But do you know what really made this morning so great? Running with and getting pushed by my friends. My experience running the bridge this morning was mostly one big attempt to catch Erin K. Our Day of Reckoning workout is essentially a 30 minute race to see how many times you can run up and down the incline on the Manhattan side of the Williamsburg Bridge. Erin passed me early on the first lap and I was determined to not let her get too far ahead of me. She rocked a solid pace and was my rabbit. It’s helpful to have somebody to chase. Shout out to Steph M. who sprinted with me on one of the downhills. I was determined to go stride with stride with her. Stephen S. — who had been running hill repeats since probably 4am (???) with Darren K. — was hot on my heels. Stephen kept creeping up and every time I turned around he was steps closer to catching me. I wasn’t going to let that happen. As a result I ran 1 full lap further than I thought I would. The rest of my run was spent high fiving everybody on the bridge, cheering for my friends, and doing the mental arithmetic to see if Harrison G. was on pace to run 6 laps in 30 minutes. And he did with ~10 seconds to spare. Incredible! Everybody who was at the Williamsburg Bridge this morning has a story from today’s Day of Reckoning. I’m willing to bet that story is about the encouragement, support, and motivation they received from their friends during the run. So if you were there you should thank somebody who motivated you. Doesn’t matter if they were ahead of you, behind you, or just cheering for you at the bottom of the bridge. The Willy B workouts might be an individual effort, but the camaraderie and teamwork are what push us to be better. If you were not there this morning, come join us sometime. All of our workouts are about having fun and making friends. The fitness just happens along the way. Why not check us out tonight for a 6:30 PM (yes, evening!) 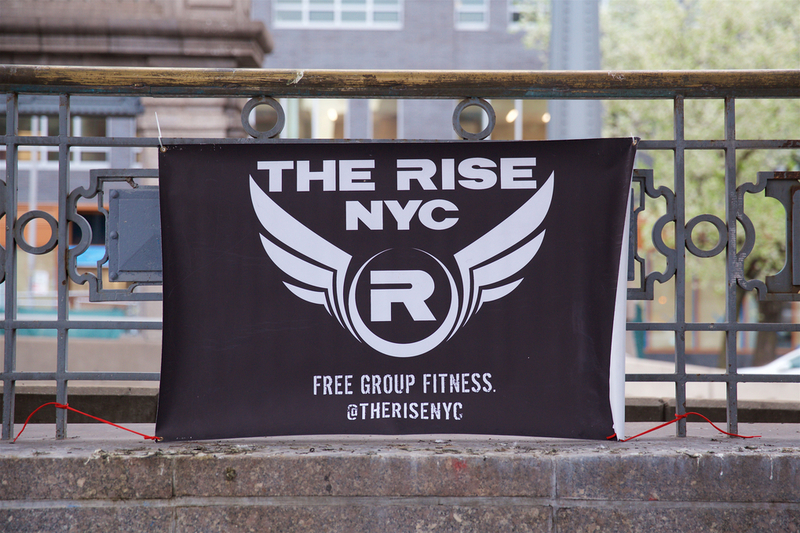 workout at Pier 45 on the Westside Highway? I’m already looking forward to running next month’s Day of Reckoning. I can’t wait to run even better than I did today! I can’t wait to see how my friends will inspire me then.